New gear comes out for the AR every day. Some of it is useful for a wide variety of shooters while other pieces are highly specialized and designed for very specific applications. Here are three pieces of kit I think are worthy of consideration for anyone owning an AR. AR’s will run dirty, but eventually you gotta clean ’em. In the past one of the worst aspects of cleaning was removing carbon buildup on the tail end of the bolt and inside the bolt carrier. Everyone had their own assortment of tools and tricks to accomplish the task. The CRT-15 Carbon Removal Tool from Magna-Matic solves that problem. There are several tools out there designed for this cleaning chore, and I’ve tried a lot of them. I like the CRT-15 best. It works well, it’s rugged, plus it’s small enough to fit in your range bag with standard cleaning gear or into a pack for field use. In an actual encounter it’s rare you’ll need a high round count to solve your problem, unless you’re in the military, but there are some situations that might present a target rich environment. Plus, who can argue that shootin’ a bunch without having to reload is fun, especially with full auto weapons in rock-and-roll mode. 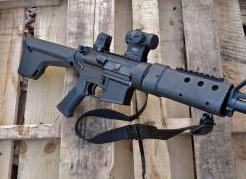 There hasn’t really been a good answer to the high-cap mag issue for the AR until Surefire released their new MAG5-60 mag, which holds sixty rounds and is 8.7 inches long. (It also comes in a hundred round version, but this involves adding almost four inches of length to the mag’s body, which I consider too long.) I took it apart, and it’s an impressive design with a very slim profile. One of my instructors took it on a T/E session of full-auto fire. Trust me when I say he abused it. It functioned flawlessly. When it comes to red-dot sights I use Aimpoint. I prefer the two MOA dot, which allows surgical shots at realistic distances, but you could only get that size dot with the larger body sights like the M series or PRO. I like the size of the Aimpoint’s micro sights, the H-1 and T-1 (which is night vision compatible); they are small and just as rugged as the larger sights, but were only available with the four moa dot. Beyond one hundred yards the larger dot, which covers four inches at one hundred or eight at two hundred, makes it more difficult to get surgical type hits. Aimpoint listened to their clients, and now the H and T sights are available with two MOA dots, a small package with excellent accuracy. This is the sight to have. It’s easy to use, has a long battery life, and there is no questioning their quality. Choose your kit carefully. Learn how to work it properly. When the time comes, use it efficiently. During a recent class we’re discussing this and Matt, one of our instructors, told about a test he ran during agency qualifications. Shooters loaded their mags with thirty rounds and were told to lock them into the rifle, rating how easy or difficult it was to seat the mag, 1 being easy and 10 difficult. When seating the AR mag with the bolt closed the bolt carrier presses the top round down into the mag. If the top round can’t be pushed down the mag will not lock in. The fully loaded aluminum G.I. mags were rated an eleven. There are a lot of different mags and components like followers and springs available today. 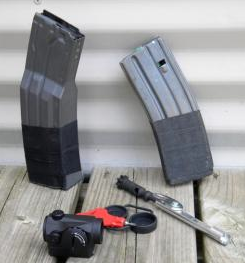 The number of rounds a mag will hold and easily seat into your rifle will vary. Your job it to figure out what works for you and your equipment. “Easy to seat” is a subjective term. What works for me will be different from someone with stronger muscles or an injured shoulder or elbow. We want as many rounds in the mags as possible. You never know how much you’ll have to shoot. At the same time those extra four or five rounds won’t do any good if the mag won’t seat in the rifle. Even if the bolt is locked to the rear, say during an empty reload, with a lot of rifles the bolt won’t have enough power to strip off the top round from an overloaded mag with too much spring pressure on the first round. The same thing applies to some pistols, especially those with high capacity double stack mags. Loading the mag completely full applies a lot of pressure to the spring and sometimes, even when the slide is cycled aggressively, it won’t chamber a round. I know several guys with high cap pistols who load with one or two rounds less than “full” because it guarantees proper functioning. 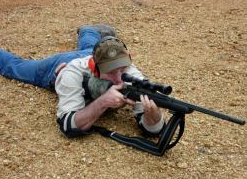 Having to take the time to smack the bottom of the mag to seat it may cost you an extra second or two on the range. 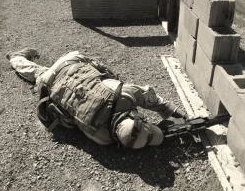 In a fight, on the ground with your elbow trapped underneath your body the ability to smoothly index the mag, slip it in and easily lock it is victory. Hand and arm injuries are common during fights. You injure your hand hitting someone. The arm doesn’t work after blocking a strike from a baseball bat. A knife cut disables tendons and muscles. You broke something after being thrown to the ground. Part of our training and practice with firearms is learning how to operate them with only one hand and arm so if injured we still stay in the fight. An area that normally isn’t addressed is the situation where you still have partial use of the injured limb or hand. A study of gunfights will reveal where a shooter lost a finger or part of a hand but still used it to reload. The hand is completely disabled but their arm continued to support a rifle. Single hand manipulations are a necessary skill, but we also need to make use of partially functioning arms and hands. Just ’cause it hurts don’t mean it’s out of the fight. The best way I’ve found to simulate partial hand injuries is with heavy bulky gloves. Thick oversize gloves create a loss of dexterity, providing a sense of loss and simulating a wound. To replicate different type wounds tape different fingers or thumb together. Tape the thumb to the hand, which takes it out of operation and forces you to use the four remaining fingers. Taping the three smallest fingers together creates a completely different type handicap. A ninety or forty five-degree section of PVC pipe taped to your elbow joint allows only partial use of that arm. The same thing can be done with knee joints, using straight or angled sections of pipe. A really large oversize bulky boot creates a sense of what an injured foot may feel like. Our actual body parts don’t feel pain. To indicate injury they transmit signals to the brain, where we “feel” pain. You can train to ignore pain, fighting and pressing on despite being wounded. Athletes do it all the time. Imagine what you can do when lives depend on ignoring an injury. A limb, hand, or foot that isn’t functioning will however affect our performance. The key is to modify your skills as necessary, which requires training and practice in advance. Preparation prevents me from having to be creative in the middle of the fight, a distinct advantage. 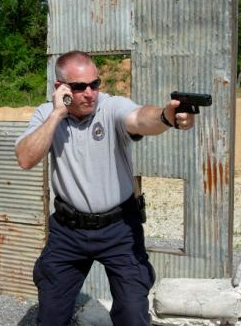 To practice these skills use dummy ammo and work dry. Safety is in effect at all times. The muzzle is pointing in a safe direction and fingers are only on the trigger when appropriate. After lots of dry practice working start moving and using cover. Finally go to the range – with a partner – and make sure when you press the trigger you hit the target. In a fight, don’t stop until you win. The AR type rifle is equipped with a bolt release, which releases the bolt whenever it’s locked to the rear, hence its name. There are times when we use the charging handle – loading the rifle when the bolt is in battery and clearing malfunctions – but anytime the bolt is locked to the rear – reloading the rifle – we press the bolt release, not cycle the charging handle. 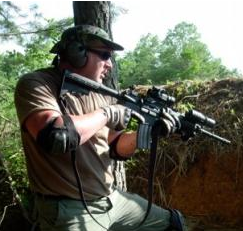 Working the bolt release is ergonomic, efficient, and the way the weapon is designed to operate. 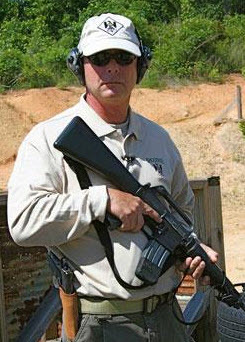 A right-handed shooter reloads the rifle by using the support hand to insert and seat the magazine – I tug to insure it’s seated – and then slides the cupped fingers up the magazine and mag-well which positions the thumb in just the right place to press the bolt release. The left-handed shooter seats the mag with the right hand, and uses their trigger finger to release the bolt. The AR is designed to be ergonomic, so hitting the bolt release is much quicker than cycling the charging handle. This technique is also efficient. You can maintain your cheekweld on the rifle while keeping the muzzle on the threat, ready for follow-up shots if necessary. To cycle the bolt you have to lift your head up off the stock, and normally at the same time the muzzle drops off target. 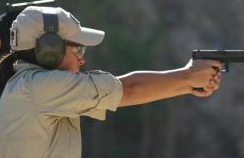 Any extra motion, like cycling the handle, lifting your head, large slapping motions with your hand to hit the release, which under stress usually takes shooters 2-3 slaps, or dropping the weapon’s muzzle off target means you’re wasting time. When reloading an empty weapon time is crucial, and efficiency is key. The more you work the charging handle the more chance there is of you creating a problem. For example people will ride the handle forward with their hand, which slows the bolt assembly down enough that it doesn’t strip a round off the mag or chamber it correctly. This is especially true with a fully loaded magazine because it takes a lot of force to strip those first few rounds out of the mag. Use the bolt release. 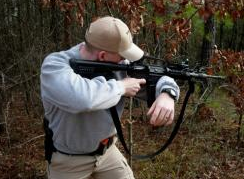 That’s the way the AR rifle is designed to operate and it’s ergonomic, which translates into efficient and quick. 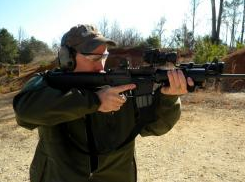 Practice all manipulations; learn when to use the bolt release or why you cycle the charging handle. Then, when you need these skills you’re able to apply them properly and without conscious thought. This may seem like a small matter to some, but in a fight often times the little things can lead to ugly stuff. Train and practice accordingly, so you’ll fight properly.